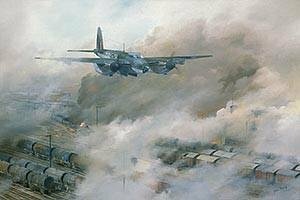 Overall size 20.5" x 15.5"
Image size 19" x 12"
The Rail Strike depicts a de-Havilland Mosquito V attacking the rail yard installation at Nantes France in June 1944. Eleven Mosquitoes went into action, chosen aircraft going in at an altitude of 60 feet. Believably, one of the main dangers encountered during such action was in fact flying through the smoke caused by previous attacks. The temptation to leave most of the rail yard exposed had to be resisted and the majority of the canvas was covered in smoke. This was quite a challenge as smoke moves and dissipates in a very natural way demanding concentration from one end of the canvas to the other. One has only to study the archive photos from the war to see the effect of the smoke, I felt this had to be interpreted on canvas.